In recent times, there has been a lot of hue & cry over the right to freedom of expression. The latest incident related to the same topic is the arrest of two young girls who expressed their opinion on a social networking website. It is evident that we as a country have become utterly confused about the concept and difference between criticism and insult. Criticism pertains to questioning or disagreeing with someone or something and which is usually (and should be) backed with logical reasoning. Whereas, insult is an emotional outburst to display the dislike for someone or something with usually no backing with logic or reason. When a person resorts to insulting another person, it is mainly because of the lack of valid logics to disagree. It is just a sign of desperation to hurt someone due to a prejudiced dislike. The debate on the right to freedom of expression has entangled itself between two sets of confused people. Those who take any and every criticism against themselves as an insult. The recent case of the arrest of the two girls is a clear example of this type of confusion. It was actually just an act of valid criticism of the concept of ‘bandhs’ which was taken as an insult. Those who think that the right to freedom of expression is actually the right to freedom to insult/abuse. The case of the cartoonist who was arrested and charged with sedition (though the charge of sedition was absolutely absurd) is an example of this type of confusion. The cartoonist displayed his emotional outburst towards the rampant corruption and ended up insulting the national symbols. This, he felt was under his right to freedom of expression. In my opinion, freedom to express oneself is about differing and disagreeing with the opinion of others and to be able to express that disagreement and question the other opinion on the basis of logic. Resorting to abusive/insulting words or expressions is a clear sign of desperation of not having a concrete logical backing for one’s opinions. Criticism towards one’s beliefs is the most common type to be perceived as an insult. The belief can be the devotion to a God, a person or even a practice. These days people tend to have such concrete beliefs that anything which logically questions that belief is taken to be an insult. 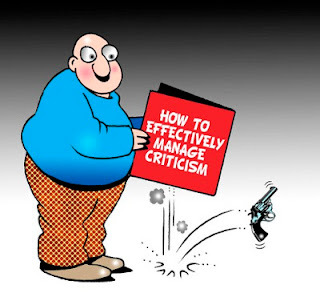 Criticism should be taken as a welcome means for self improvement. Not being questioned leaves a person in oblivion about the validity of his own thoughts. Also, criticism is a handy tool to correct the shortcomings of people and organizations. It makes room for debate in situations which may be heading in a pre-judged but faulty direction. On the other hand, sometime back as I tried to reason with another blogger who thought that freedom of expression meant freedom to insult, I realized how the freedom can be made a tool to create nuisance. Take for example, the case of the cartoonist above. India has had some brilliant cartoonists like Sudhir Dhar, R. K. Laxman, Sudhir Tailang, Ajit Ninan and many more. None of them had to resort to rude, crude or vulgar drawings but still managed to put their opinions across so strongly. I’m not a believer in religious practices. I question and criticize religious practices (even specific Gods) on the basis of logic and reason. But that doesn’t make me abuse or insult just for the sake of disagreement. I would debate a religious devotee on the basis of my logics but not to insult him or his religion. India is facing a time of increasing intolerance to criticism and simultaneous increase in abusive/insulting expressions of opinions. Those in high places of social, political and religious power are highly intolerant to criticism which they interpret as insult. Mostly, the political class resorts to abuses/insults just because they don’t have a logical backing to their opinions. And this includes the so-called emerging crusaders against corruption who often cross the line from criticism to abuse. While debating with the blogger I mentioned earlier, I was told that feeling abused or insulted is a subjective thing. Something appearing abusive to one person may not be similarly perceived by another. Yes, I agree that there are extremes of people on both ends of the spectrum. But that doesn’t mean we bring the bar right down to the base and expect everyone to be able to tolerate abusive language or behavior. If a person feels hurt by my cordial communication, it is entirely his problem. But if I express myself in an abusive or insulting manner and expect others to be okay with it, then it is my problem. If only us Indians could learn to take valid criticisms cordially and stop being fanatics for the right to freedom of expression (which is often equated to freedom to abuse). It is only when criticism is done cordially and sensibly that it really becomes the real freedom of expression. There is a thin line dividing criticism and abuse. While Aseem did over step the line in expressing frustrations, the government over stepped when they arrested him. In Shaheens case, it was sheer misuse of power by the police and local leadership. Her comment was innocuous and there was no need to arrest the girls. The vandalism, that followed was the worst part. While the state needs to handle criticism, people need to understand that criticize is acceptable, but not abuse. The last line sums it up all. Exactly ! In the present scenario, neither can people take criticism nor do they understand their responsibilities which come with the freedom of expression. I know my viewers would appreciate your work. If you are even remotely interested, feel free to shoot me an email.